I hadn’t been aware of the Milli Fire, which had started the day before, so it was quite a shock to see this impressive plume of smoke just north of the Three Sisters. There’s quite a variety of conifers on the summit, all kept unusually short by wind, snow, and rocky conditions. 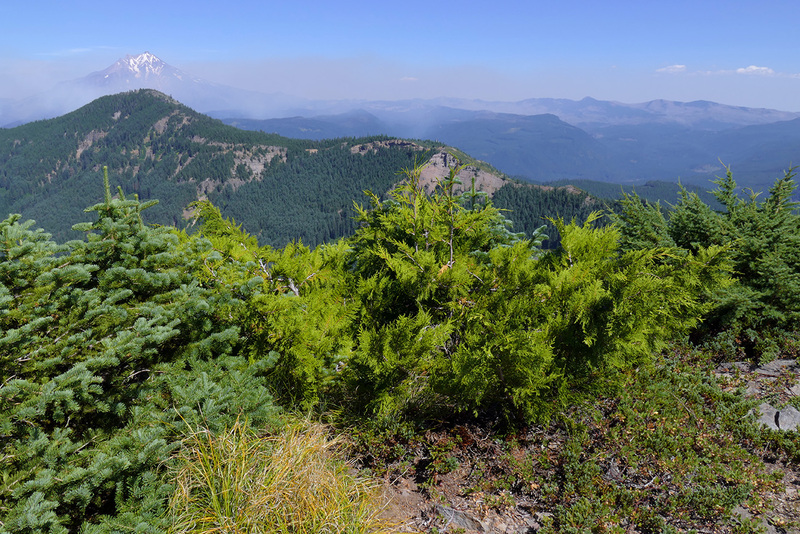 (Left) the normally ground-hugging common juniper (Juniperus communis), (center) a very squat subalpine fir (Abies lasiocarpa), and (right) a shrubby Pacific yew (Taxus brevifolia). 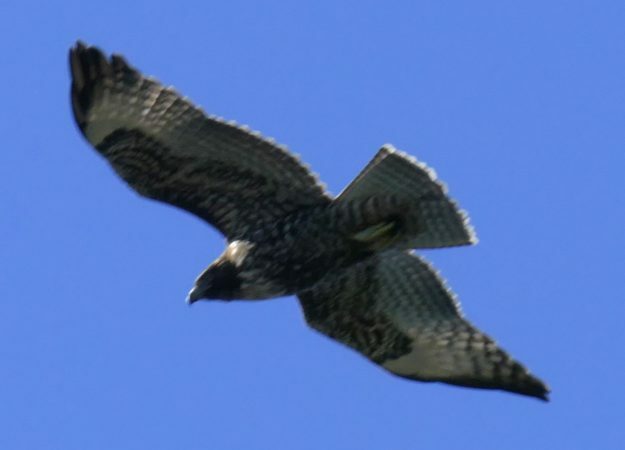 A young harrier was among several soaring high above the sloping meadows. I’m used to seeing them alone, flying very low just over the ground, so I didn’t recognize them at first, in spite of their distinctive white rump patches. I’m finally attempting to catch up on everything that I fell behind on over the last few months. I wanted to post some photos from a trip to Coffin Mountain I took on August 16 but didn’t get around to. Somehow I just couldn’t get to writing about the late summer trips, even though I was stuck inside most of the time, avoiding the smoke for much of August and September. It’s a little odd writing about those awful hot, dry, and smoky months while I listen to the steady rain outside. At the time, I couldn’t wait for rainy season to come and put out the fires and clear the air. It was hard to imagine the drought and fires would ever end. And now the rain is here—and I’m already dreaming about next year’s sunny summer days! Earlier in the year, an old friend of mine, Charles, who had been living in Germany for a number of years, contacted me and said he and his daughter Lucia would be vacationing in the Pacific Northwest and were planning to stay at Breitenbush for a while in August. 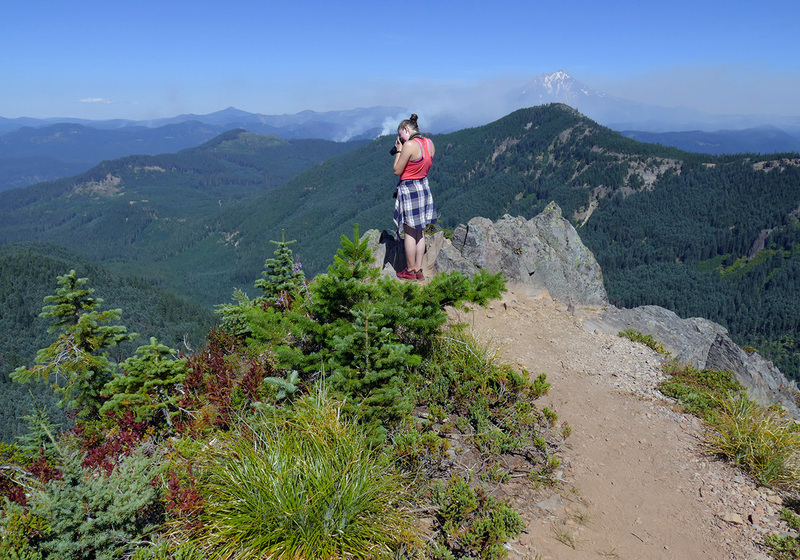 I hadn’t been to Coffin Mountain in several years, and as it is near Breitenbush and one of the best trails I know in the Western Cascades anyway, I suggested we could meet up there for a hike. A very dwarfed Alaska cedar (Callitropsis nootkatensis) also braves the exposure of the summit, another subalpine fir to its left and a mountain hemlock (Tsuga mertensiana) to its right. When the day finally came, I was quite worried about the smoky conditions, but we were lucky and managed to get above the smoke. The wind was also still blowing most of it to the east at the time, so we actually had a very nice hike. The views were great, and it was very interesting seeing all the fire activity—from a safe distance. Lucia photographing the view from the summit. She wasn’t feeling well in the morning and was reluctant to come on the hike, but she perked when she finally got to the top and was rewarded by the fantastic view. Smoke from the Whitewater and Scorpion fires can be seen coming from a number of different spots. Those fires had started weeks before. 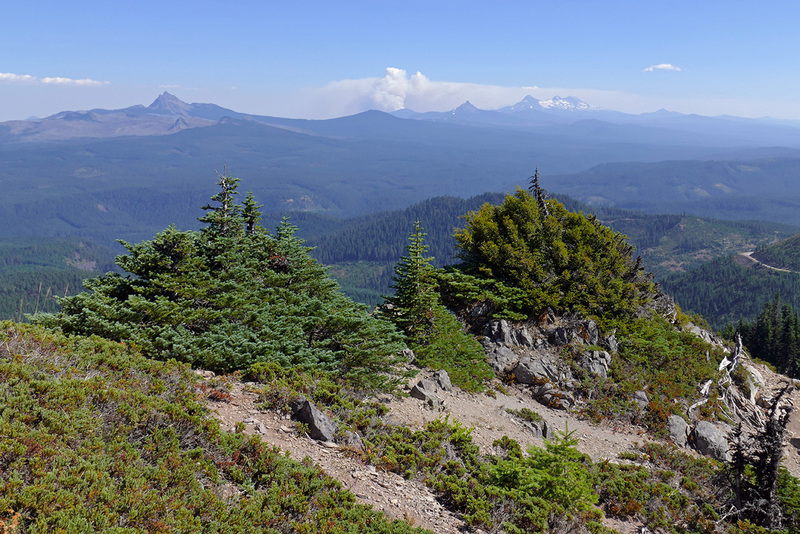 Mount Jefferson is partially obscured by the smoke. The flowers were mostly done other than asters and fireweed (Chamerion angustifolium), but I was happy to collect seed of some of the earlier flowering species. We didn’t see many butterflies, but it turned out to be an excellent day of bird watching (although I did find photographing hawks in flight to be quite challenging!). It was great catching up with my friend, and it was wonderful getting out of the smoke for at least part of the day. But I’m so glad the smoke and fires are over with now. Let’s hope next summer is not so brutal! 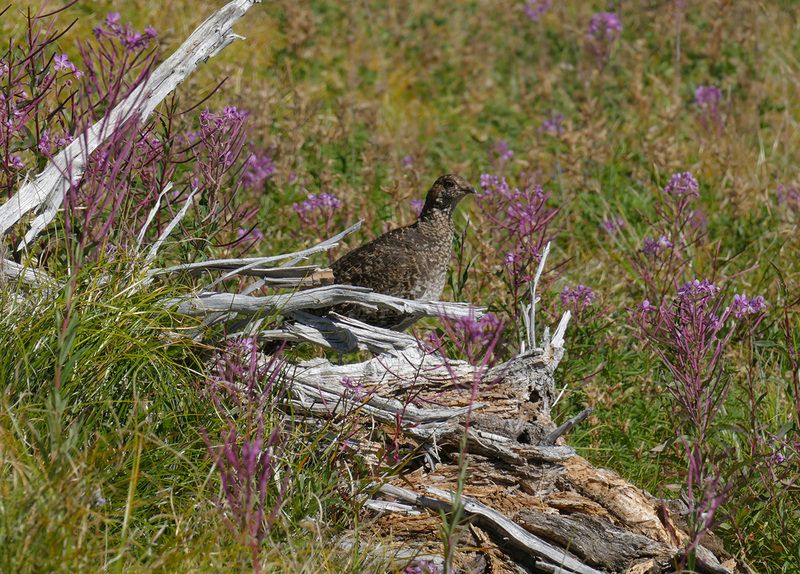 A grouse was making odd noises that caught our attention on the way up. 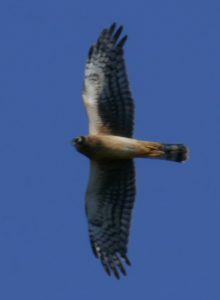 A number of red-tailed hawks surprised us when we were on the summit. They swept up from beneath us and then disappear and reappeared repeatedly. They seemed to be having a blast!